Difference between revisions of "Project X"
This WormKit module is not compatible with the latest W:A update (3.7.2). If you try to load this module into the version that is incompatible, W:A may crash. Read this for information. To the module author: Please consider adding a version check to the module code. Project X is a game editor for Worms Armageddon. The program includes features from The Fiddler, and the ability to create custom scripts, which allow you to control objects and events in the game. There project includes a game and script editor, and a map editor for making map-specific events. 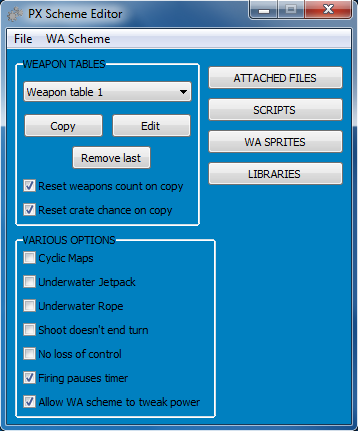 The game and script editor can edit existing weapons in the game, and add additional weapons with weapon 'tables'. The program also has partial support for adding new sprites to the game. The Project X module it self can be used online if all players have the same version of the .dll file. However, players will still need to have the same version of the script to be able to launch the game without desync. The host could also "send" script to user who "request" it (triggered automatically); BUT additionally to the hosting port that he may have forwarded, he must forward the port 17011 TCP in order to have the module correctly "listening" to other players' request. You will need either W:A 3.6.28.0 or 3.6.29.0 and WormKit installed. Download and extract the files in the rar file (can be opened with 7-Zip) into your Worms Armageddon directory. To create your own schemes, go into the PX Scheme Editor directory, and run PXSchemeEd.exe. Save the scheme files in your "Worms Armageddon\PXSchemes" directory. To run Project X, open WormKit.exe, then minimise W:A, select the PX scheme from the drop-down list, and maximise W:A. You will then be playing with the scheme file loaded.